Last Thursday evening, when I walked down my street from the bus stop (I’m such a tree-hugger), I spied a foreign object in our driveway. My eyesight isn’t what it used to be, so from afar I thought it was a sweater. (Why I might think a sweater would be in our driveway on a 95-degree day is a topic for another day. Don’t question my logic!) 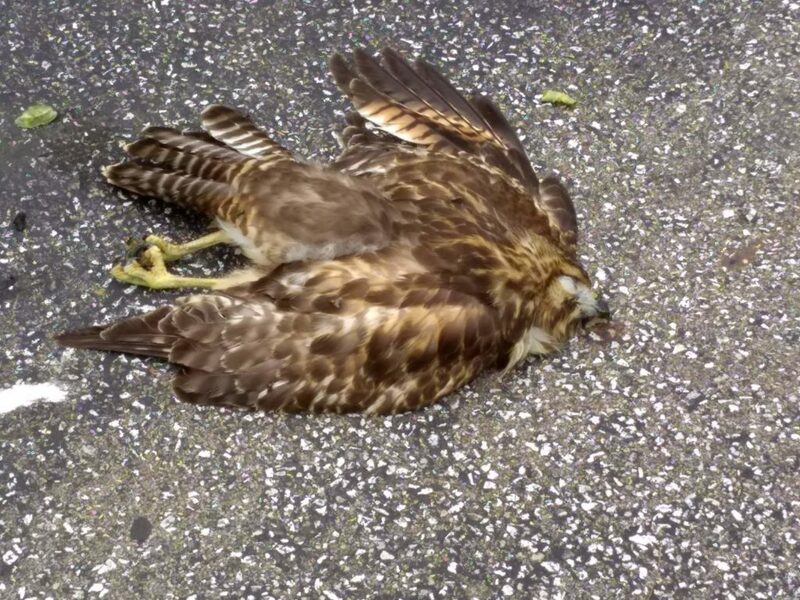 But upon closer inspection, it turned out to be a baby hawk… deceased. It damn near broke my heart. There’s a hawk nest in one of our neighbor’s trees, and we’ve been hearing hawks screeching non-stop over the past few weeks, and watching them go from tree to tree. Once I even spotted the baby’s head peeking out from the nest, which was so cool. I’m guessing this little lad (or lass) was from that nest. What should I do with the body? Answer: dispose of it via the trash or burial… the only thing you can’t do is keep it/taxidermy. Why did this happen? Answer: Fledglings are still “getting their wings” – they tend to be rather unsteady fliers, so they’re prone to running into things. Also, there’s “failure to thrive” – if the parents aren’t still helping them get food once they leave the nest, they could be malnourished. And our current heat wave certainly doesn’t help matters. The woman from Raptor Inc. said they’ve been getting a lot of reports of dead baby hawks during this fledging season. I don’t know about you, but whenever I see a hawk soaring majestically over the highest trees, I’m jealous. “You lucky son of a gun, you get to fly! And you don’t even have to flap your wings much… you just float on the air!” This was a not-so-subtle reminder that life can be a struggle, even for the most majestic creatures. On Saturday, I saw two adult hawks on the same branch of a neighbor’s tree. I felt like they were trying to tell me that things will be OK. One hawk may be gone, but the species will survive. Thanks JK! We’ll have to feed the birds together at lunch soon.